Video-View allows you to conduct both virtual video interviews, where the candidate uses a webcam to answer preselected questions, and live video interviews. Virtual interviews replace time consuming, difficult to schedule phone screens, while providing better insight into your candidate. Live interviews save travel time and cost over flying a candidate in for an interview. 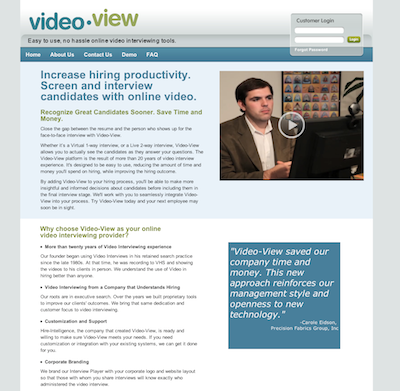 Video-View is designed for enterprise applications. Video-View has multiple user roles (recruiter, manager, administrator) with a hierarchical user structure allowing for multiple locations, departments, etc. Video-View allows for complete corporate branding. Also available is client usage tracking for both internal and external clients. Customized email templates can be easily created including corporate stationary. Most importantly all video interviews can be easily shared via a system generated email.